With the backing up of our diligent personnel and rich experience, we are able to offer Quartz Grits. This range of quartz grits is widely acknowledged in the market for its high chemical and physical properties. 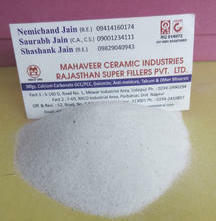 We are renowned manufacturer and supplier of a sufficient gamut of Quartz Grits. The offered product is natural silica powder having purity of more than 99%. This silica powder comes in a very snow white color, the whiteness in our A grade silica is more than 96%. The offered Quartz Grits is used in a number of applications.